Step 1 Combine 1/2 teaspoon garlic, oil, Sherry, red pepper flakes, salt and pepper in a resealable plastic bag. Add shrimp and shake to coat evenly. Marinate 15 minutes. Step 2 Fry bacon in skillet over medium heat until crisp, 5 minutes. Drain on paper towels. Set aside. Step 3Combine mayonnaise with 1/2 teaspoon minced garlic and chipotle; set aside. Step 4Drain shrimp and saute in hot skillet over high heat until slightly pink and opaque, 2 to 3 minutes. (You can also broil or grill the shrimp). Step 5Toast bread. Spread each slice with 1 tablespoon chipotle mayonnaise. Divide shrimp between 2 slices. Top with avocado, then bacon slices. Place 2 tomato slices on top of bacon and top with lettuce. Cover with remaining bread slices. Use toothpicks to hold sandwiches together. Cut sandwiches in half and serve. In Recipes-list.com we have selected the most viewed recipes from category - Fish and shellfish Main courses Sandwiches . Enjoy the best recipes specially selected for you! 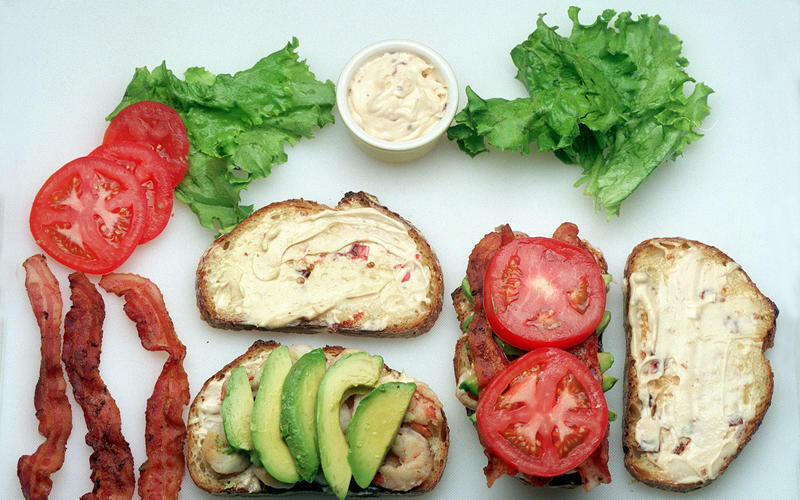 Shrimp Club Sandwiches With Chipotle Mayonnaise is the right choice that will satisfy all your claims.